Labradorite is a mystical stone protector. Taking on the characteristic energies of both the Sun and the Moon. 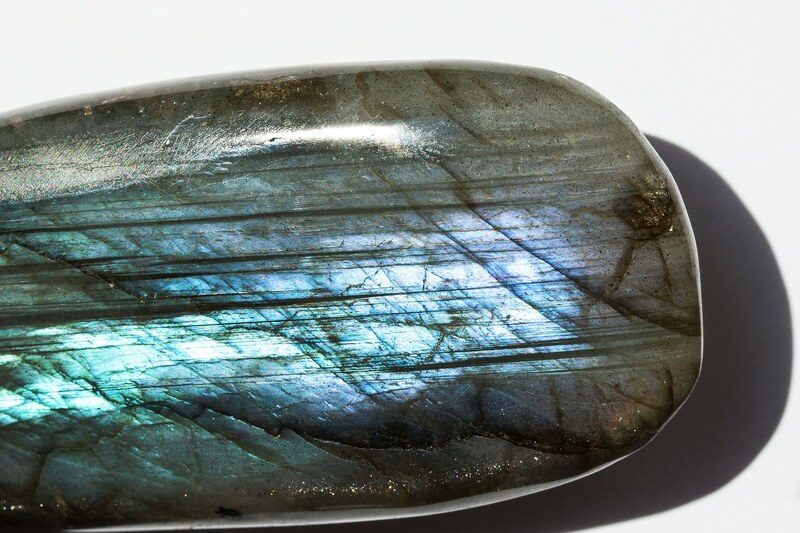 Labradorite is helping to assure success and bring changes in the quality of life. This stone helps develop novel ideas and promotes innovations. Labradorite is facilitating the communication between the subconscious and conscious mind, thereby awaking intuition and knowledge about the past and future lives. Labradorite stone is preventing from the unnecessary loss of energy at the level of the etheric body. On top of the beautiful gray to gray-black background, Labradorite is sparkling with many iridescent colors. The stone is very often displaying blue, golden, yellow, green, red, or purple shades when seen from different angles. There are usually one, two, or three dominant colors, contributing to the blue, green or golden overall gleam of Labradorite. Sizable deposits of Labradorite are found in the USA, Madagascar, Finland, Russia, Canada, Greenland, and Scandinavia. The meaning of this stone comes from the location in which it was first found, as it was named after Labrador in Canada. The Finnish stone is called Spectrolite, and is slightly different as it exhibits the full range of colors. Labradorite is a stone of magic, awakening the mystical and magical abilities and psychic powers. The stone’s resonance is very powerful, and can bring amazing changes to the life. Labradorite’s vibration is also holding a broad level of protection from negativity. Labradorite is a stone whose energy is quite visible to the user, as seems to work so quickly. Only wearing the stone seems to charge you with a sense of excitement and adventure, to take the steps required to go where you have not gone before. The reason to believe it is a stone for magic is a belief that those who used it had access to a range of abilities that seemed almost magical. Labradorite Crystal brings you the gift of serendipity and synchronicity. These two things combined can make amazing things happen in your life. Those little coincidences, where you are in the right place at just the right time, just seem to occur more often once you begin to use this stone. Labradorite stone is having a number of interesting metaphysical properties, including protecting your aura, and clearing negativity. If you have been doing too much and need a recharge, Labradorite will give energy to you. Within the throat chakra it stimulates stronger psychic communication abilities, which you may utilize in a range of different ways. Have you have been wondering if you have any psychic abilities, but you are not quite sure how to start the process to develop them? You may find that any gifts that are waiting to develop may begin to manifest, as you make better connections. You may learn how to be psychic once you begin to use a Labradorite stone.